Join us for Macworld Live! Macworld’s Chris Breen and the folks at iFixit talk about repairing your broken Apple gear. Macworld’s Dan Moren and a group of developers discuss developing apps for Apple’s App Store and Mac App Store. 1:00 - 1:20 PM: BrainShark: Play PowerPoint Properly on your iPad. 1:30 - 1:50 PM: Soonr: Smart ways companies are using the iPad to do business faster. Macworld’s Philip Michaels hosts a panel of experts who square off in a battle of punditry, tackling the burning issues of the day and scoring points for hard-hitting answers. Macworld’s Jason Snell and the founders of the Original iPhone Film Festival talk about iPhone filmmaking. Their grand prize will be revealed on stage. Macworld’s Jason Snell, Andy Ihnatko, and John Gruber discuss where the new, Tim Cook-led Apple will go in 2012 and beyond. Chris Breen is joined by painter Bert Monroy, photographer Eduardo Solér, and musician Steve Lipson to talk about the effect technology has had on their creative work. Macworld’s Serenity Caldwell hosts Chris Breen, Ted Landau, and Dan Frakes to discuss today’s major Mac and iOS troubleshooting issues. Ross Nover and Marty Day host the Super Art Fight, a battle of virtual brushes, wits, and time. Includes artists Brandon J. Carr, Jamie Baldwin, and Jamie Noguchi. Macworld’s Roman Loyola presents the Best of Show Awards to the outstanding products found on the show floor. Jason Snell hosts a live rendition of The Incomparable podcast and is joined by Serenity Caldwell, Dan Moren, and Glenn Fleishman in a geeky conversation about the intersection of sci-fi and technology. The old model of paper-based books and periodicals is changing. Chris Breen is joined by e-publishers Adam and Tonya Engst as well as member of their Take Control and TidBITS crew to discuss digital text from a publisher and writer’s perspective. Serenity Caldwell talks about some of the cool products she’s discovered on the show floor. She’s joined by several product and gadget makers to discuss their work. We love great software, but even the best software has flaws. The panel hosted by Lex Friedman and featuring Glenn Fleishman, John Gruber, Paul Kafasis, Guy English, and Dave Wiskus will discuss such flaws in their favorite apps, their ideas for fixing them, and why it’s so hard for even the best apps to achieve perfection. 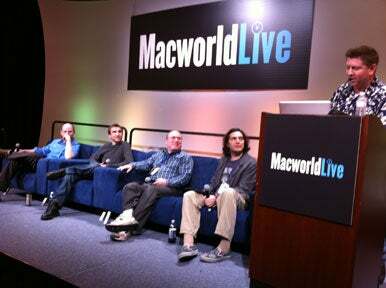 Chris Breen hosts Jason Snell, Dan Frakes, Serenity Caldwell, and Dan Moren to discuss everything that was Macworld|iWorld.